Dave Beatty has been a professional photographer since 1945. After many years as a full-time newspaper photographer, he left his job at the Illinois State Journal-Register and opened his own studio in 1958. He is a Master of Photography. This is his story. 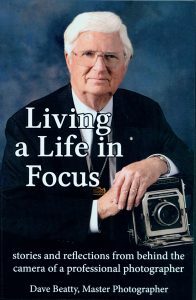 Living a Life in Focus is a collection of stories and reflections from our own master photographer, Dave Beatty. We’re proud announce that the first run of copies is now available for purchase. You can pick it up in person, or online.